History, Architecture, and Creole Culture - this is a crash course in New Orleans history. This 2 hour walking tour has plenty of fun facts and true stories to entertain even the veteran visitor to the city. Why do they call it a po-boy? Was there really a streetcar named Desire? Follow your guide through three centuries of intriguing history and creole culture. Your leisurely stroll through the Vieux Care' (Old Square), as the French Quarter is properly known will begin at the statue of the city founder, Jean Baptiste de le Moyne Sieur de Bienville. As the tour progresses, your guide will explain the different types of architecture and how it was adapted to the hot, humid climate. Bring your camera because there will be plenty of examples of Creole cottages, townhouses, and shotgun houses. Many of them are adorned with wooden gingerbread or elaborate cast or wrought iron balconies and galleries. 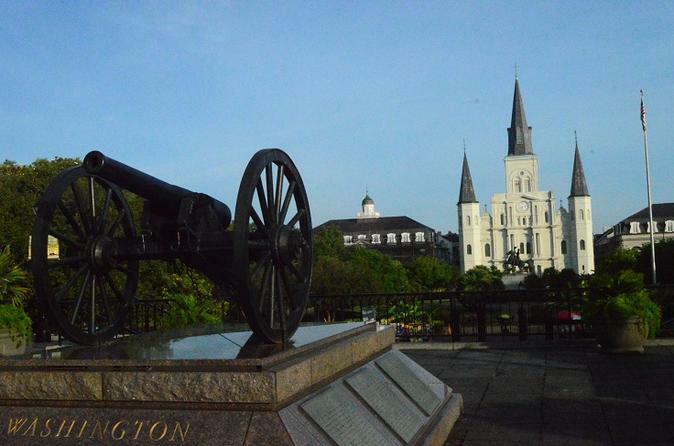 The journey through the French Quarter will provide photo ops of historical and cultural landmarks. One popular stop is Jackson Square. Here, you can expect a narration on buildings that surround it, including the St. Louis Cathedral and the Square's namesake. Visitors always ask us, so your guide will also point out several locations used in movies such as Runaway Jury, Double Jeopardy, and NCIS: New Orleans. The tour will conclude at the French Market. We believe that this is the absolute best spot to end a tour. Nearby, to almost whatever you might want or need at the end of a 2 hour walking tour. It is in very close proximity to restrooms, food, drink, shopping, pedi-cabs, a streetcar stop and Frenchman street. This tour is limited to only 15 guests per day! The city of New Orleans allows for tour groups to operate with up to 30 guests. We at Storyville Tour Company believe that is a disservice to those guests. We limit this tour group to only 15 people because we want them to have the best experience. We want everyone in the group to be able to hear our guides, without interrupting a family eating on their gallery. We also want you to ask your questions and not to give rushed answers. We believe you will find this to be a very enjoyable experience.